There is no mistaking the Athletic Base Ball Club of Philadelphia when the team takes the field. Their uniforms are wool; their collars are encircled with bow ties; their trousers are held in place by a double-buckled belt; and they wear no gloves. Their game is base ball - yes, two words back then - as played in the 1860s. Dan Gordon, president of the club, pauses before a Saturday afternoon game to explain the Victorian approach to America&apos;s pastime: "This was a gentlemanly game, which required proper attire and proper attitude. Most of the working class men of that era were off fighting the Civil War. The sport, then, was left to the wealthy men at home, who took it up in public exhibition." The societal traditions of class and culture even extended to the chatter on the field. Unlike games today, spectators and players ("ballists") were expected to maintain a certain decorum. "Rude language was forbidden," Gordon says. "But ‘gentlemanly chides&apos; were perfectly acceptable." The nine players on "team-Athletics" excel at this aspect of play. Against the opposing team - the gents of the Brandywine Base Ball Club - they trade barbs and jibes. Batters are called "strikers," so the call "Striker to the line!" is the 1860s equivalent of "Batter up!" As a striker comes to the plate, his skills are sarcastically assessed with the comment that perhaps the team mascot, Summer, could hit better. Summer is a two-year-old American Staffordshire Terrier who happily watches from the shade of a nearby tree, which is encircled by her leash. "We stress the entertaining side of the game," Gordon says. "What we do is probably 40 percent athletics and 60 percent performance." Many of the rules of modern-day baseball govern this retro version (nine innings, nine positions, three strikes per out, etc.). However, there are major differences: One umpire, outfitted in a long coat and straw hat, calls not only balls and strikes but also the safe/out decisions in the field. There is no pitchers&apos; mound, and all throws are underhanded, with no windup. "We take the word ‘pitch&apos; literally," Gordon points out. "So the motion is much like pitching a horseshoe." Still, pitchers of skill can still produce enough speed to throw breaking balls, sliders and knuckleballs. Gordon joined the Athletics in 2013 to fulfill a life-long desire to play. "I have bad eyes. Even as a kid, I was cut from every team I tried out for. I washed out of baseball in middle school, in high school and in little league," he remembers. At an Athletics exhibition game, Gordon watched the action and saw a team that, because of its sole reliance on volunteers, he couldn&apos;t be dropped from. To address his faulty vision while playing, he went to the effort to purchase period glasses. "These have no modern materials in them at all," he says, taking off his spectacles. "I have them made by an optician who specializes in Civil War eyewear. The stems are iron and the lenses are ground glass." The eyewear is so sturdy, they protected Gordon from injury when he was recently hit by a soaring ball that caught him high on his cheekbone. "I had a nasty bruise, but the glasses were fine." Gordon makes his living as a work-from-home payroll administrator. His other hobbies include home-brewing beer, and he often brings samples to the games to share. Speaking of refreshments, one modern-day stadium staple is noticeably absent from Athletics&apos; games: the hot dog. "Back then, there was no provision in the field for either refrigeration or cooking," Gordon says. "So what was served during these games was very much in the style of 19th century picnic food. That would have been pickled eggs, raw oysters, nuts and dried fruits. Pickled lamb&apos;s tongue was also very popular." Imagine the challenge of trying to sell those in the 700-level stands of Citizens Bank Park. 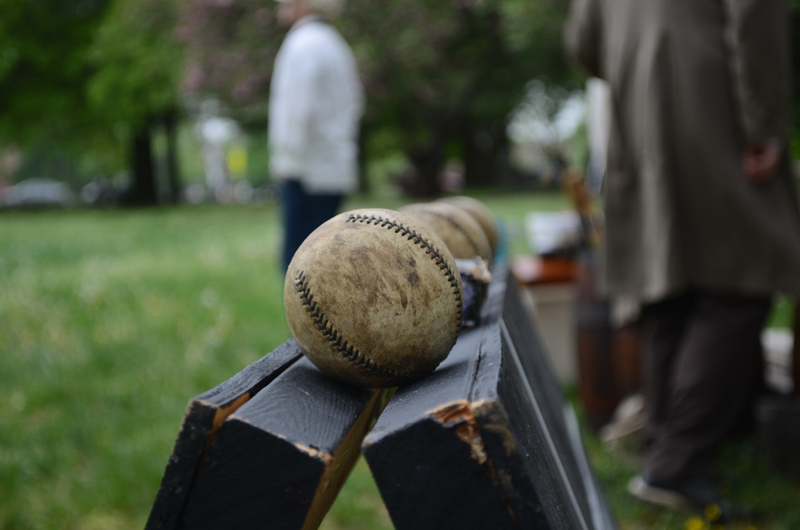 The Philadelphia Athletics are bringing their base ball skills to Pennypacker Mills on June 20, taking on the Bog Island Boys of Farmingdale, N.J. The game is free, and spectators are welcome. Should the Athletics prove victorious, the appropriate celebratory yell, in keeping with the old-time feel, is not "yay," but, rather, "huzzah!" 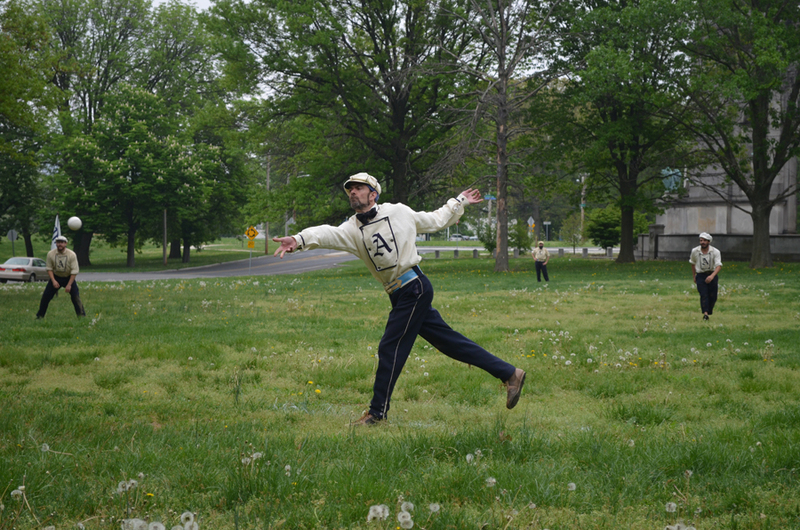 Even in Victorian baseball, the point of the game is to score runs by making it home. If your plans for the weekend include so much activity that you need a temporary "home" to rest up in, consider one of the fine accommodations listed on our website. Several B&Bs in the county date back to the Victorian era and provide that level of white-glove service, such as The Globe Inn in East Greenville.